The IntelliChart Online is a web-based package. It is a more basic version of our Windows-based software. You can still change the style of the chart, adjust the color of the background, draw your own trend lines and save your own settings. You can also use the extensive selection of time scales and periods, and still benefit from dozens of technical indicators. 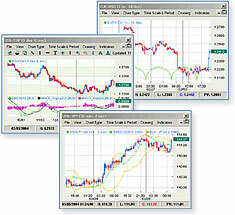 The Online software can be easily integrated into your trading platform if it is a web-based trading platform. White label and minor customization is also available.